India is a land of many religions, cultures and ethnicities and one thing that is common to all religions and cultures in India and the world is weddings. In almost monogamist cultures; marriage is a way of cementing relations between men and women. A wedding is a ceremonial process that announces a marital union between a man and a woman and all cultures and religions have their own distinctive wedding traditions and rituals. Likewise; in all cultures and religions; a wedding is a festive and celebratory event. Weddings are interesting for so many different reasons however they are all the more interesting when seen through the lens of a religion or culture; apart from your own. This blog aims to delve deeper into types of marriage in India; linked to different cultures and religions in India. Read further to know more. Almost all major world religions are represented in India. This country is a secular nation in the true sense of the word “secular”; as almost all religions thrive here. The majority of Indians are made up of Hindus and Hinduism has it fair share of different sects. Muslims or followers of Islam make up for the largest minority group in India and there are two primary sects of Islam; Shiites and Sunnis. Christian’s are yet another well-represented minority in India and are further divided into multiple sects of Christianity with varying theological standpoints. Buddhists, Jains and Sikhs are also prominent minority groups of different religious affiliations in India. Bearing in mind that all of these different religions coexist in the country; one must also note that each religion has its own distinctive practices and rituals which bear influence on important life events such as weddings. Exploring the fascinating aspects of weddings of various religions and cultures within India makes for interesting and insightful reading; so scroll down to know more. There are many fascinating aspects to a Hindu wedding; these comprise of age old rituals and traditions rooted in the Vedas. The most important and interesting among these are as listed below. Astrology plays an important role in Hindu weddings. While astrology is often used to determine compatibility between a man and women; the positioning of the stars and the astrological charts almost always determine the date and time of the wedding. 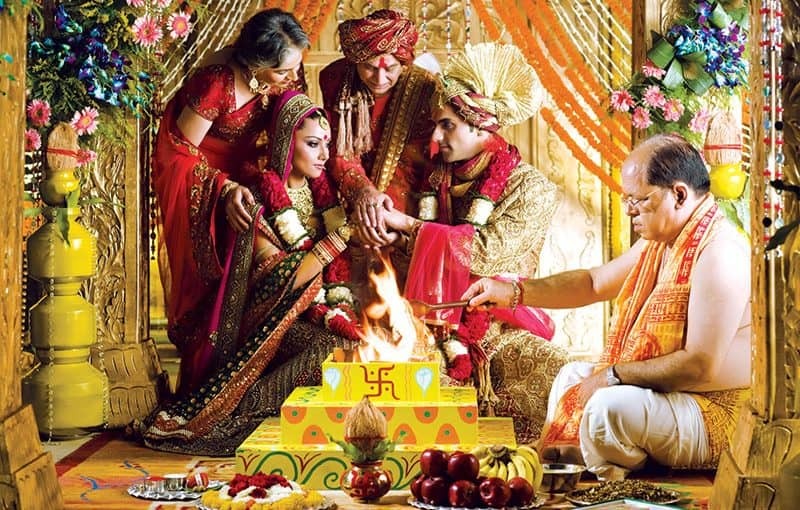 This is known as the “Shubh Mauhurat” or “Auspicious Moment” for the most important wedding rituals to take place. Many foreign cultures indulge in wedding pre-parties which are mini-celebrations in anticipation of an even bigger celebration; the wedding. The Hindu version of the wedding pre-party is the sangeet ceremony. Sangeet ceremonies are most common in North India and they are characterized by singing, dancing and general merrymaking. The sangeet ceremony is an important occasion for the bride and groom and as such special sangeet ensembles for men and women are an integral part of wedding fashion in India. The bride and grooms family often indulge in informal singing and dancing competitions during this event which are best described as impromptu or practiced sing-offs and dance-offs. Preparing the bride for the wedding is a ritual in itself and often times, a Hindu bride’s female friends and relatives will gather along with the bride for a Mehendi Ceremony. During this ceremony; the bride’s hands and feet are adorned with beautiful henna patterns. Henna application or mehendi is so popular among Indian brides that henna artists form an important subsection of the wedding industry in India. Hinduism adheres to a matriarchal family structure which is why the “Kanyadaan” is an important ritual in Hindu marriages. This is the ritual in which the father of the bride formally hands over his daughter to the groom. During this ritual; the father of the bride asks the groom to keep his promise to love, protect and provide for his daughter. The groom formally takes on these responsibilities from the father at this stage. Panigrahana is the holding of hands ritual around the wedding fire which is lit by the groom. During this ritual the Hindu groom recites vows to four Hindu deities; accepting his marital responsibilities. Saptapadi or Saat Phere involves the walking around the sacred wedding fire by both the bride and the groom who are bound together by their garments. The Saat Phere or seven steps of walking around the wedding fire represents seven vows that are said out loud in Sanskrit. Exchanges of garlands between the bride and the groom, the application of Sindoor on the brides forehead by the groom and the gifting of a Mangalsutra; are all small but important rituals that are symbolic of marital union among Hindu men and women. The final ritualistic step of the Hindu wedding is the Griha Pravesh. During this ritual; the bride makes her formal entry into her husband’s home for the first time. Aarti is performed by the groom’s mother at the doorstep even before the bride can make her entry into her new home and she is required to topple over a vessel filled with rice at the doorstep even while stepping in for the first time. The entry of the bride into her husband’s home is considered the entry of prosperity and happiness and these rituals are symbolic of these beliefs. Muslims are one of many minority groups in the country and make up for an important part of the Indian population. As in any other religion; the union between a man and woman is formalized with a traditional exchanging of vows and other wedding rituals. Islam has its own special wedding rituals however everything revolves around the primary ceremony which is the Nikah. Similar to Hindu weddings; Muslim weddings in India are also preceded by the arrival of the groom at the wedding avenue with his entourage or “Baraat”. The Baraat is heartily welcomed by the bride’s family and friends. The Nikah is the primary Islamic wedding ritual wherein the bride and the groom make public their acceptance of the marital union. This is done by reciting “Qubool Hai” or “I accept” in Urdu 3 times when prompted by the Maulvi or Islamic priest presiding over the wedding. This is known as the Ijab-e-Qubool ritual. This is followed by signing of the marriage contract or Nikahnamah. During this ceremony; the groom often presents the father of the bride with a bride price which is an amount of cash known as “Mehr”. The bride and the groom are separated from each other during this ceremony. The Arsi Mushraf ritual is when the Muslim bride and groom first get to lay eyes on each other through a mirror placed between them. A Quran is also placed on top of the mirror. 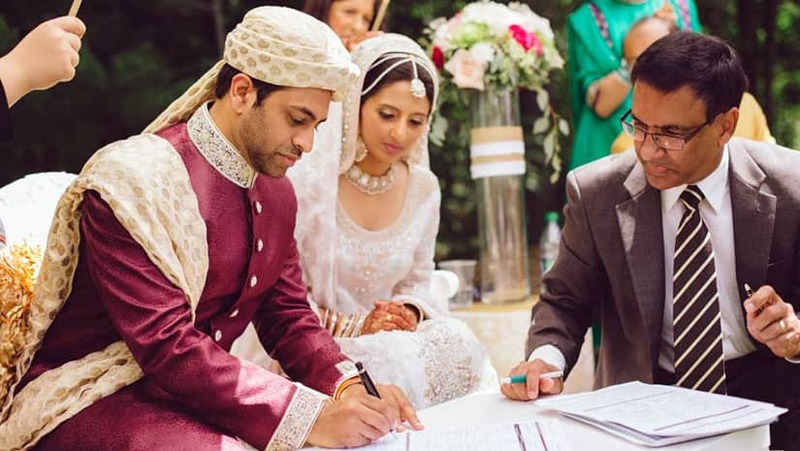 The Quran Scriptures play an important part in a Muslim wedding and verses from the Quran are read to solemnize the wedding. Buddhism originated in India and continues to be one of the major religions in this country. Buddhists have their own distinctive religious practices and rituals which extend to Buddhist weddings. During the course of the wedding; both the bride and the groom are dressed in a Bhaku which is a sarong like brocade dress. The actual wedding structure comprises of matchmaking, Khachang and Nangchan and the actual wedding ceremony. There are many different marriage customs in India however some form of matchmaking takes places in all cases. With Buddhist marriages; matchmaking happens when the groom’s family visits the bride’s family with a marriage proposal. During this time; gifts are given by the groom’s family to bride’s family. Accepting these gifts signifies acceptance of the marriage proposal. At this point horoscopes are also matched and an auspicious date and time for the marriage is fixed. Nangchan is a ritual in which the bride and groom are betrothed to each other by way of engagement. This is formal ceremony presided over by a Rinpoche or Buddhist Monk. Prayers are often recited and holy scriptures are read during this ceremony. Gifts are also exchanged between two families and drinking and feasting is common. The groom almost always starts living with the bride in her home after this ceremony. The Buddhist wedding rituals are mostly unique but in some ways similar to general marriage rituals in India. Some form of dowry is exchanged even though the groom pays the bride’s father a dowry. Vows are recited from the Sigilovdda Sutta, prayers and offerings are made to the local Buddhist shrine; however these rituals are carried out; away from the Buddhist temple. 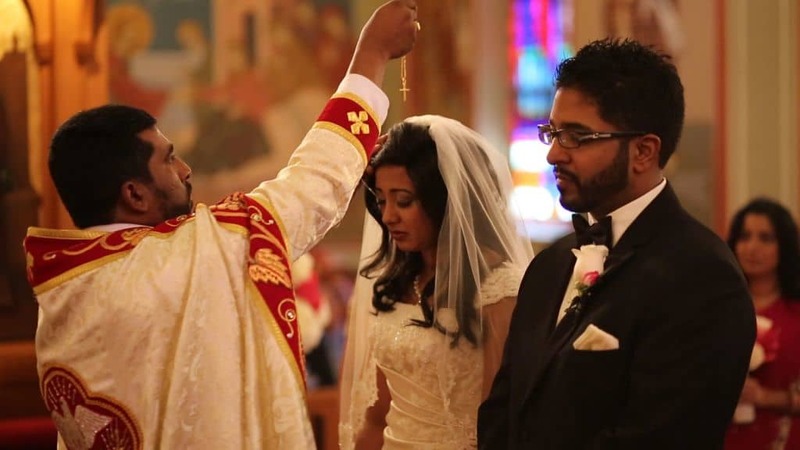 Christian weddings are more ceremonial than ritualistic. The actual wedding ceremony is a short process marked by the exchange of vows, rings and scripture readings from the Bible. A priest presides over this ceremony that often takes place inside a church however this venue is not compulsory. Much like the Hindu wedding; the bride’s father walks the bride to the altar and hands her over to the groom. It is hence easy to see that while there are many types of marriage in India; there are some commonalities among them. The wedding ceremony is followed by a grand reception which is marked by the cutting of a wedding cake. A piece of this cake is often saved by the bride and groom as a wedding souvenir. Dancing is big part of a Christian wedding and the bride and her father often do the ceremonial ‘last dance’ before the bride and the groom get together for their first couple’s dance. The highlight of the Christian wedding is the brides white gown which is symbolic of purity and chastity and often boasts of a long beautiful train and a veil for the face. The groom usually dresses in a two or three piece suit. Sikh Weddings are similar to Hindu weddings in many ways but also quite unique. The history of Sikhism as a detour from Hinduism shows in its rituals and religious practices. These rituals and practices extend to ceremonial events like weddings which is why Sikh weddings are similar in many ways to Hindu weddings. Read further to know how. The Roka and Thaka are the pre-wedding rituals for Sikh couples and their families. The Roka and Thaka are characterized by the father of the bride visiting the groom’s home and the father of the groom doing the same for the bride. This signifies whole hearted support from both sides of the family for the wedding. During Roka and Thaka; gifts in the form of sweets and clothing is exchanged between both families and the bride and groom are blessed by their respective in-laws. 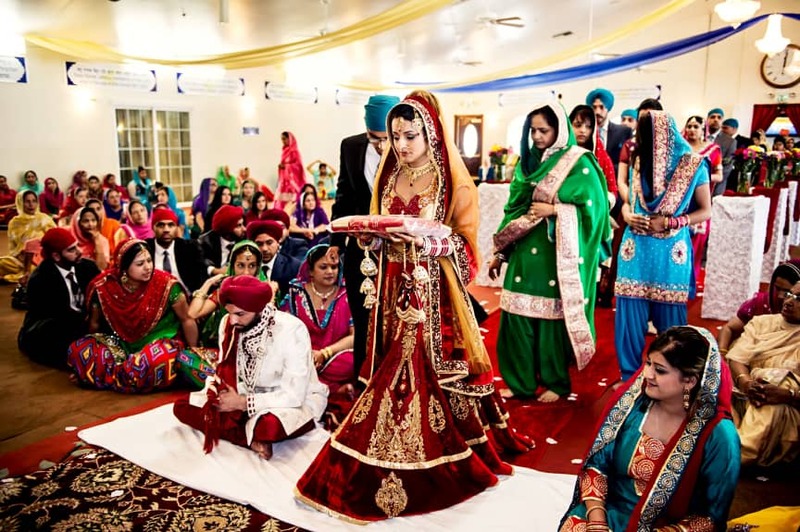 The formal engagement ceremony among Sikh couples is known as Kurmai. Among the different marriage customs in India; this is one that takes places exclusively during the morning or daytime in a gurudwara. Before any formalities can commence; the priest of the Gurudwara offers prayers for the couple. The groom then proceeds to present the bride with a ring while the bride’s family presents the groom with a Kara and Kripan; the symbolic steel bangle and small knife that Sikh men carry everywhere. After a few other minor rituals; food and beverages are served to all guests and family members on both sides. Sometimes within a week prior to the wedding comes the Akhand Path; a reading of the entire Guru Granth Sahib within 48 hours; by different members of the family. Similar to Hindu weddings; there are mehendi ceremonies, the Kirtan which is day set aside for singing mainly religious songs, the arrival of the baraat and the hearty welcome by the bride’s family. Additionally; many other small but unique rituals make up the entire Sikh wedding. In conclusion; it must be noted that there is often a common thread running between all these major religions and their wedding rituals. Religions like Jainism are so similar to Hinduism in terms of wedding rituals that there is only a negligible difference between the two. In all cases; the Indian wedding; immaterial of religion or caste; is a grand affair.